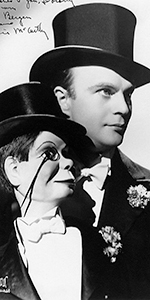 Charlie McCarty and Edgar Bergen. Unknown date. Probably the best-known of the stars to grace the golden age of radio, Edgar Bergen and his friends Charlie McCarty and Mortimer Snerd also appeared in a number of movies, making him a full-fledged movie star. Bergen made many appearances on television, and is best remembered today for being the father of actor Candice Bergen. Born into a large Swedish family in Chicago, the whole group moved to Sweden when Edgar was 4, where he learned the Swedish language. Then everybody moved back to Chicago; by the time Edgar was 11, he was learning the art of ventriloquism from a pamphlet called "The Wizard's Manual." Bergen worked odd jobs to support himself, attracting the notice of ventriloquist Harry Lester, with whom he studied. In 1919, Bergen paid a woodcarver to make a likeness of a newspaper boy he knew — who would become his lifelong sidekick — Charlie McCarthy. Attending Northwestern University to please his mother, Bergen switiched from Pre Med to Drama, but dropped out. Between 1922 and 1925, Bergen performed on the Chautauqua circuit, while studying to become an areoplane pilot (something to fall back on, perhaps). Appearances in vaudeville led to Bergen's first movies, such as the Vitaphone short The Operation (released in February, 1930), and All American Drawback (released in October, 1935). But it was on radio that brought Bergen into the homes of millions. It went like this: Elsa Maxwell saw Bergen perform at a party in New York. She told her friend Noël Coward, who got Bergen a gig performing in the Rainbow Room in Rockerfeller Center. Some producers saw him perform there, then booked Bergen for Rudy Vallée's radio show. Bergen and McCarthy were an instant hit. They were so popular that they were put into The Chase and Sanborn Hour, where they were part of the show for many years. Why the act would work on radio no one seemed to fully understand, but it did through Bergen's unique sense of humor and skill as a presenter and performer. Bergen and McCarthy were prominently featured in The Goldwyn Follies (released in February, 1938). They were getting ready to release Letter of Introduction, when their director, John M. Stahl joined Bergen and Charlie as they made their imprints in a Forecourt ceremony. Other films Bergen appeared in include You Can't Cheat an Honest Man (released in February, 1939), Charlie McCarthy, Detective (released in December, 1939), Stage Door Canteen (which played the Chinese in July, 1943), Fun and Fancy Free (released in September, 1947), and I Remember Mama (released in March, 1948). In 1949, McCarthy had been forced out of Chase and Sandborn, retired beiefly, then launched The Charlie McCarthy Show, which ran until 1954. The Edger Bergen Hour began in 1954, and ran until 1956, by which time, all the big advertising money had switched to television. Bergen made many guest appearances in various television shows, including: The Milton Berle Show (1959), Voyage to the Bottom of the Sea (1964), Burke's Law (1964), Rowan & Martin's Laugh-In (1968), and played Zebulon Walton in the TV movie The Homecoming: A Christmas Story (1971), which became The Waltons (the role was assumed by Will Geer). Bergen held a "Farewell to Show Business" engegement at Caesars Palace in Las Vegas for two weeks in 1978. Three days after the end of the gig, he passed away of Kidney disease at the age of 75. Grauman's Chinese Theatre, Hollywood, California. Edgar Bergen Forecourt ceremony, Wednesday, July 20, 1938. 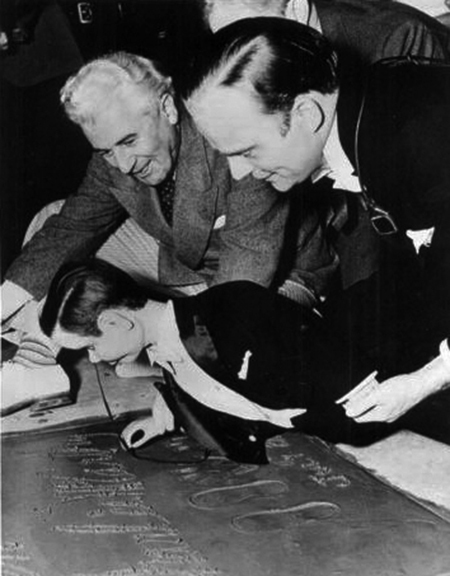 Director John M. Stahl looks on as Charlie McCarthy signs his name in the cement (with the help of Edgar Bergen).